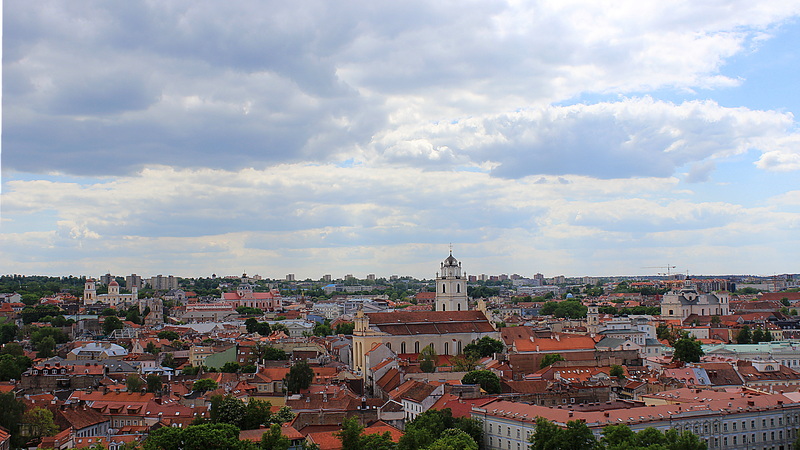 A view to the Old Town of Vilnius from Gediminas Hill. When things don’t go as planned, it is very relieving to have people ready to help you out. My train from Klaipėda to Vilnius had a malfunction and stopped in the middle of the journey. The announcements in the train were only in Lithuanian and the passengers around me didn’t speak English, but I asked them about the situations with my crude ”survival Russian” and understood that no one knows when the train would start moving again. My original arrival time would have been around 20:30 in the evening. I don’t enjoy walking on the streets of big cities after dark (especially with a backpack and only a vague idea of where I should go), so I had chosen a train that would be in Vilnius before sunset and asked my host Petri – a Finnish friend of a friend whom I had never met – to meet me at the station. After half an hour of motionless waiting, I texted Petri to tell him about the delay and asked if he could still come to the station an hour after the original arrival time. A few minutes later, he replied and told me that it wasn’t a problem. I was relieved. Not everyone, however, could adjust to the delay so easily. As I was waiting on my seat for the train to start moving again, I heard someone on the other end of the carriage ask a Lithuanian girl about the delay – in English. The local passenger told him that the train could possibly be delayed for two hours. 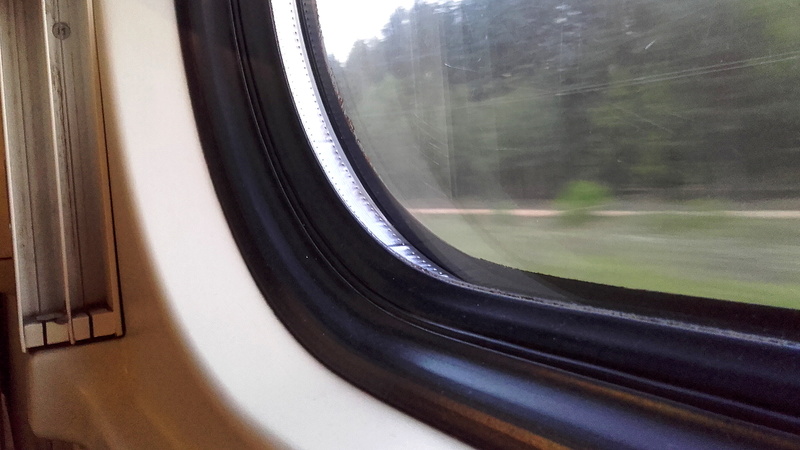 Even though my own train trip didn’t go as planned, I still recommend trains in Lithuania. They are often cheaper than buses and students get a 50 % discount. Once the girl had left, I got up from my seat. I went to talk to the other backpacker who had just spoken English. The young guy, Marius, told me he was from Germany and that he had a bus connection to Warsaw leaving the same night. Now he wasn’t sure if he’d catch his bus. Once I heard this, I told him that if he didn’t have any other place to stay, I could ask my friend if he had room for an extra traveler at his place. 1) I was just reading a self help book about how to be a better person to others. 2) I’ve been in a very similar situation once. I was then saved by a stranger who came to me and offered me a place to stay in her home. So, I was simply passing on the kindness of strangers. After I went back to my seat, I started to hesitate if my offer was such a good idea after all. Was I going off my limits by offering a place to stay on behalf of someone I had never met? 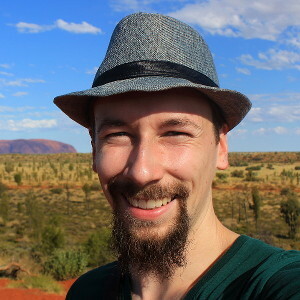 What if Petri didn’t want to host more strangers – would I just give false hope to the German backpacker by telling he might have a place to stay? I didn’t send a message to Petri yet as I was hoping Marius could still catch his bus. For a while, this seemed to be the case. The train started moving again after an hour of standing still. Alas, the train wasn’t moving as quickly as before. As it became clear that Marius had missed his bus, I texted Petri if he could host another traveler the same night. Luckily, Petri was completely fine with the sudden turn of events. He responded that if I thought the guy was OK, it would be no problem to him. Once we arrived to Vilnius, Petri was waiting for us at a bar terrace nearby. We sat down for a while. At the terrace, Petri admitted he had actually misunderstood the day of my arrival. He was expecting me to come two weeks later and only realized I was coming that day once I sent him a text message about the delay of the train. I can only admire how flexible Petri was with the whole situation! 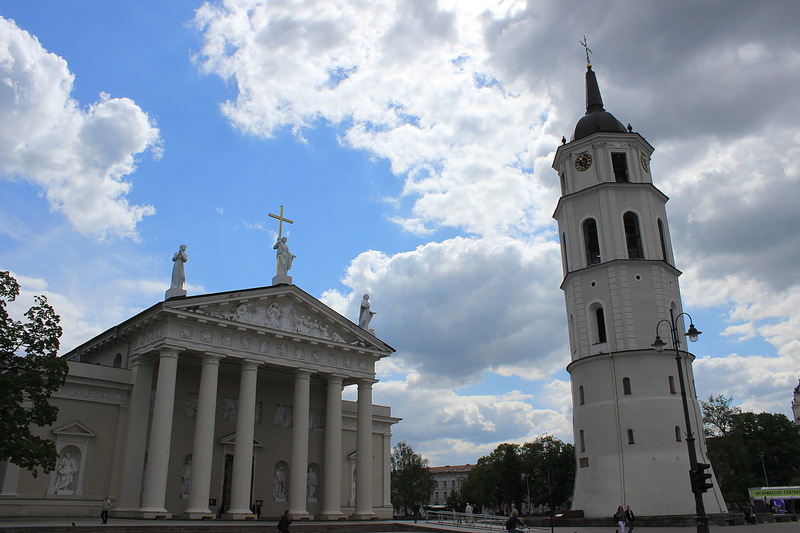 The following morning, Marius continued his Baltic tour to Warsaw and I went for a walk around Vilnius. Petri’s place was just a few hundred meters away from the Cathedral of Vilnius. 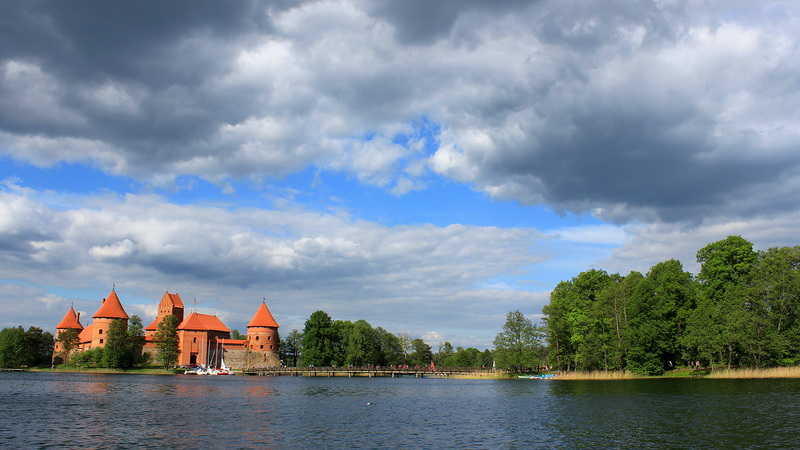 The following day, I took a bus to Trakai to see the famous Trakai Castle.